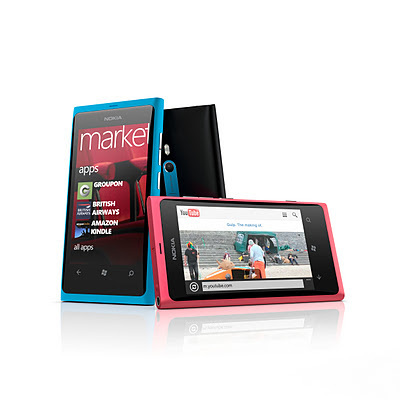 The Nokia Lumia 800 with the Windows Phone Mango OS was launched at the Nokia World event at London along with a few other models. The phone has a smooth curved glass, 3.7" WVGA AMOLED touchscreen and powered by a 1.4 GHz processor (single core). 8MP camera with Carl Zeiss lens and LED flash. Can take HD movies (720 pixels resolution) with 30 frames per second playback. Comes with 512 MB SDRAM memory and 16 GB storage memory. I was surprised when I learnt that there was no slot for micro-SD cards. However, I learnt that users would have 25GB of free SkyDrive storage. Some people were not happy that it also does not have a TV output though I wonder how many people would use that particular option. The phone also lacks a front facing camera. The Nokia Lumia 800 is available in 3 colours, viz., Cyan, Black and Magenta. You can preorder the phone on their website and it looks like it would be cheapest on the Vodaphone network (£99.00 cost for the phone and £33.50 monthly or free for £36.00 per month (both on 24 month long contracts).